A bride that loves a long sleeve?! Embraces a dark lip?! And has the best laugh?! Every appointment with this bride was a riot; she is so full of positive energy and not to mention some killer style! To say that we were waiting with baited breath for these photos is an understatement! 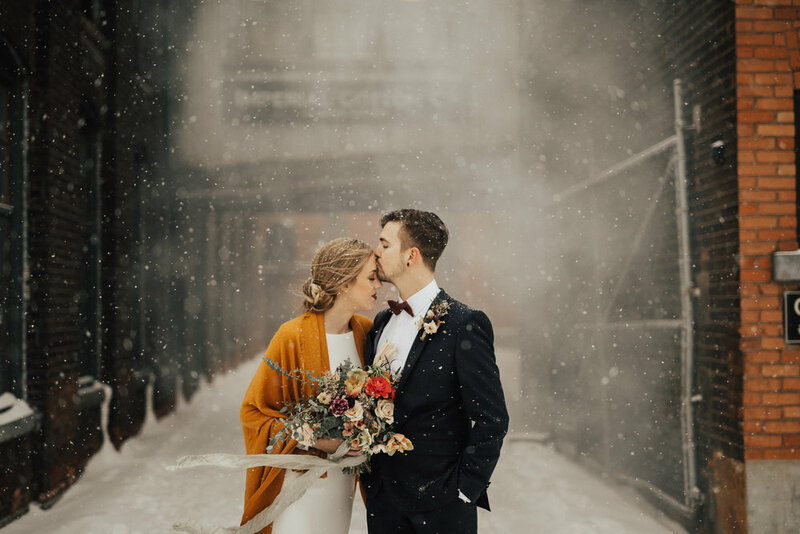 Her love for her groom is so clear and that little dusting of snow makes this whole day look like an absolute dream. Congratulations you two, wishing you every happiness together! Photography: Nick Parry - Nautical Studios - Hamilton, ON. Venue: Donut Monster, Cotton Factory, Spice Factory - Hamilton, ON. 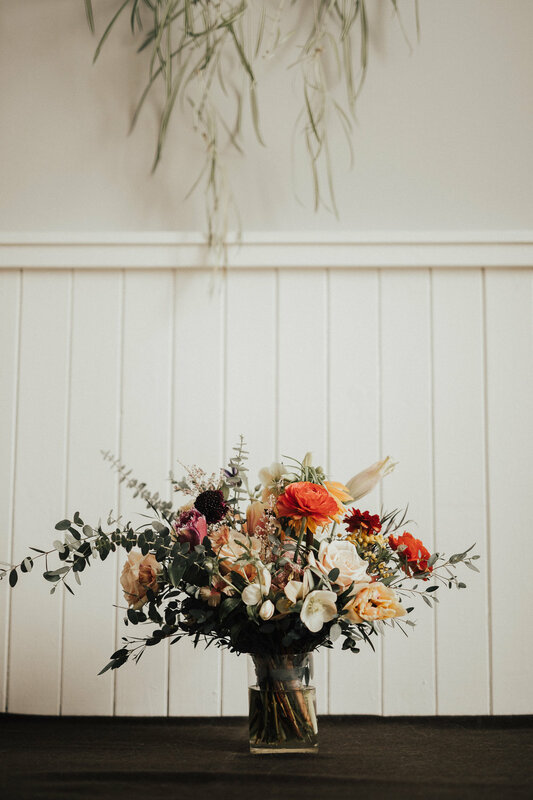 Florist: Jessica Heather - A Fine Medley - Hamilton, ON. "Tim and I met while working at Target Canada. We both had worked there for about a year before we started to take interest in each other." Short, sweet and with a beautiful happy ending. "Turning around the corner into the ceremony and watching the look on Tim's face when he finally got to see me! He was so cute with the biggest smile plastered across his face! 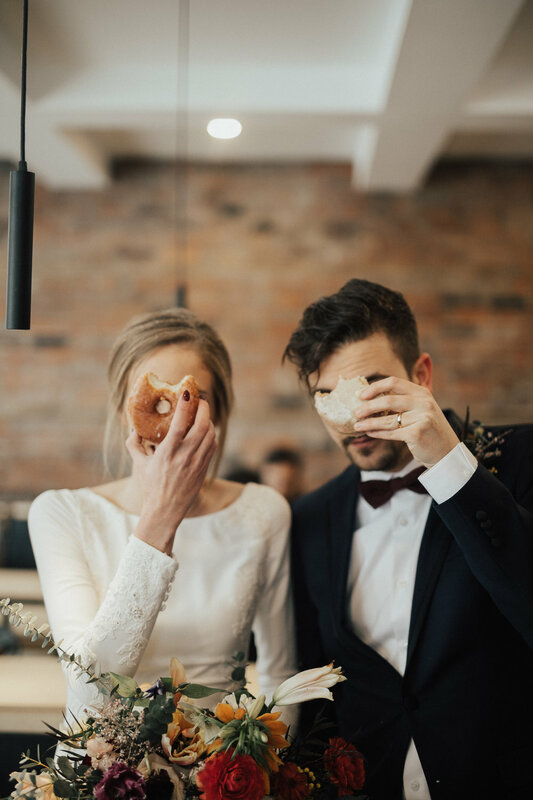 Or maybe taking the wedding party for Donuts at Hamilton's Donut Monster after the ceremony! They loved it!" Nothing beats a pit stop to the Donut Monster! Who knew that eating donut could be so darling?! "Try your best going into your appointments with an open mind - but also don't put too much pressure on yourself. 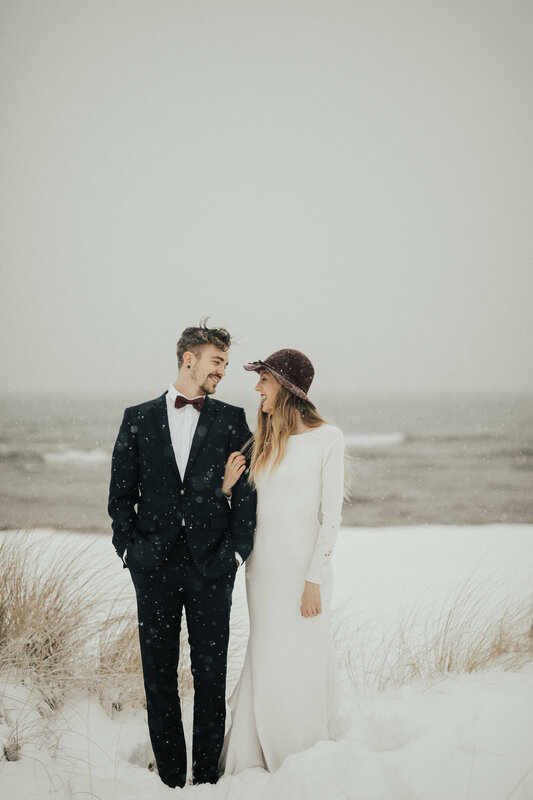 By the time I walked into TMB I had gone to 6 other bridal shops and tried on a million dresses and was feeling very defeated. I told Jess what I had in mind - and without hesitation she knew exactly which dress would be perfect for me! But of course she made me try it on last because she knew it would be my favourite - and she was not wrong!! So definitely trust the consultant. 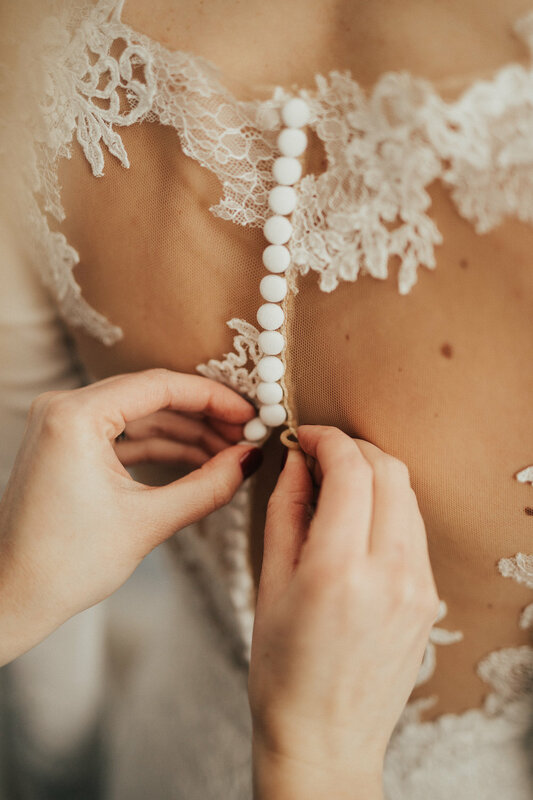 Its their job - they know what dresses will look good on what body types - and sometimes having someone with some knowledge of the product can make the deciding process that much easier!" It is all in the details. From the dress to the bouquet, it is the small things that truly complete the look. "By far the highlight of the day was my dress. Every single person that attended our wedding kept commenting on how gorgeous and perfect my dress was for my body and I couldn't have agreed more. I loved it so much - we even went out the day after the wedding to take additional pictures in it with our photographer! It's not every day that your male photographer loves your dress so much that he wants to take more pictures of it!" Huge congratulations to these two! Hoping that all our future TMB brides have as much fun on their wedding day as this hubby and wifey! !